Amid the geopolitical competition between China and the U.S. around Chinese investment in Europe, there are mixed views across the EU countries when it comes to which country is seen more favorably. While the U.S. is still seen more favorably in several countries, its image in Europe has shown a significant decline in positive evaluations since 2016, when majorities in nine of the 10 countries had favorable views of the U.S. Some European countries gave China more favorable ratings than they did the U.S. 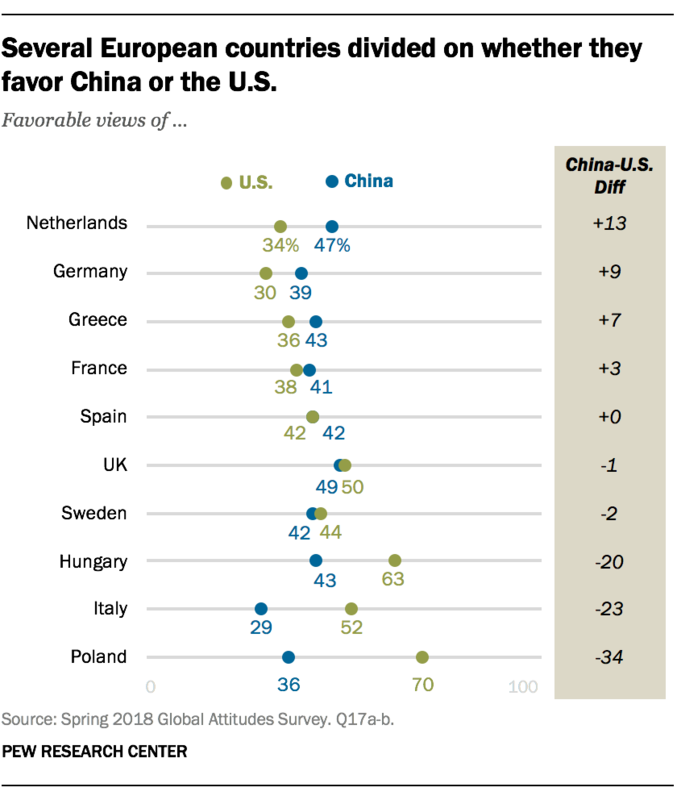 In the Netherlands, 47% of people had a positive evaluation of China, compared with only 34% who said the same about the U.S. Similarly, German ratings of China were 9 percentage points higher than those of the U.S., and Greek ratings were 7 points higher. But others evaluated the U.S. more positively than they do China. In Poland, 70% had a favorable view of the U.S., while only 36% had a favorable view of China. Positive ratings of the U.S. in Italy were also 23 percentage points greater than those of China and 20 points greater in Hungary. 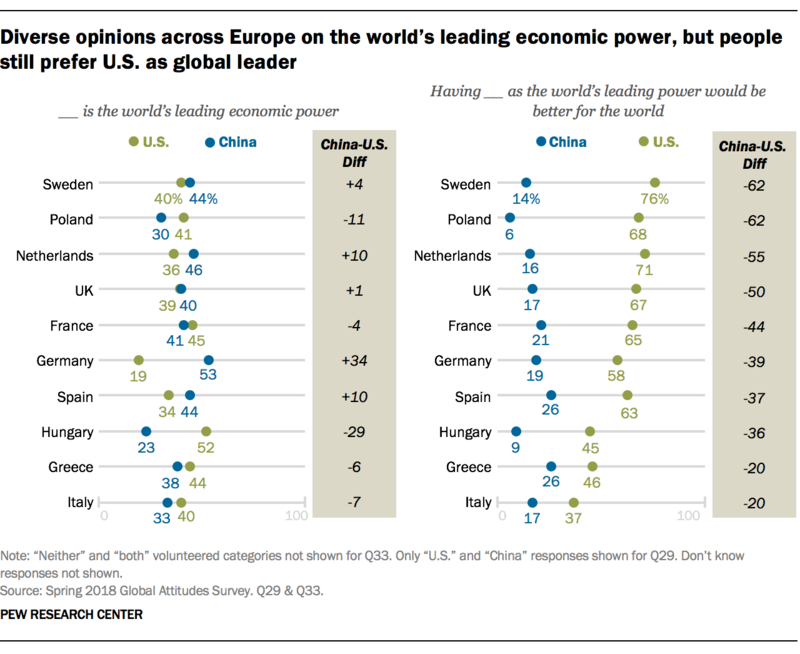 The European countries surveyed also have mixed opinions about who they regard as the world’s leading economic power, but they overwhelmingly favor U.S. global leadership over that of China. Among the European countries surveyed, only in Germany, the Netherlands and Spain do more people believe China is the top economic power compared with the U.S. Yet majorities in seven of 10 EU countries believe having the U.S., and not China, as the overall leading global power would be better for the world. Pluralities in Greece and Hungary share this view. Italy stands apart from other European countries, with just 37% favoring U.S. leadership in the world while about a quarter (23%) think neither the U.S. nor China are preferable leaders. An additional 16% of Italians think having both the U.S. and China would be best. 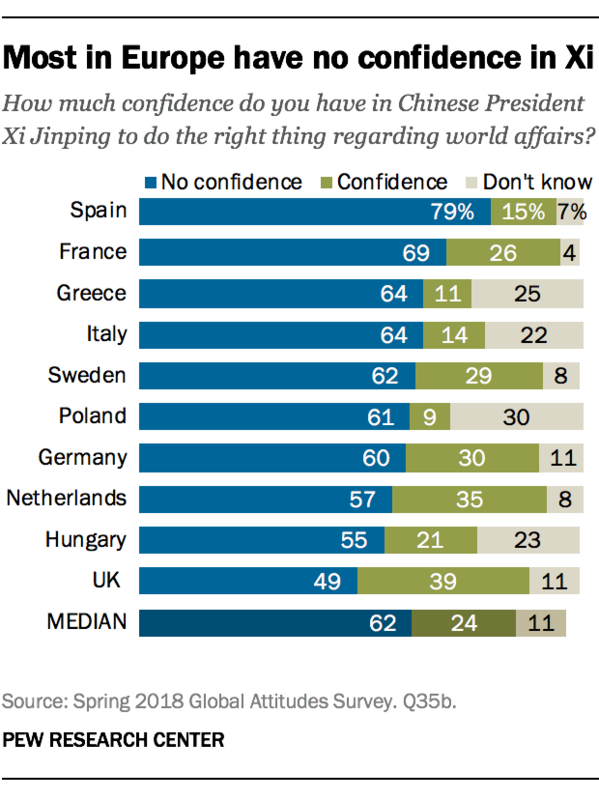 Still, lack of enthusiasm for Chinese leadership does not equate to concern about Beijing’s power: A median of just 31% across the 10 European nations see China’s power and influence as a major threat to their country, the lowest level of worry expressed across eight different threats tested. In comparison, a median of 37% in Europe see American power and influence as a major threat. The latest attempt by Beijing to woo European cooperation in investment partnerships is not China’s first foray into the region. In fact, all 10 countries surveyed have received billions of dollars from China across different industries since 2005, according to an analysis of American Enterprise Institute’s China Global Investment Tracker. 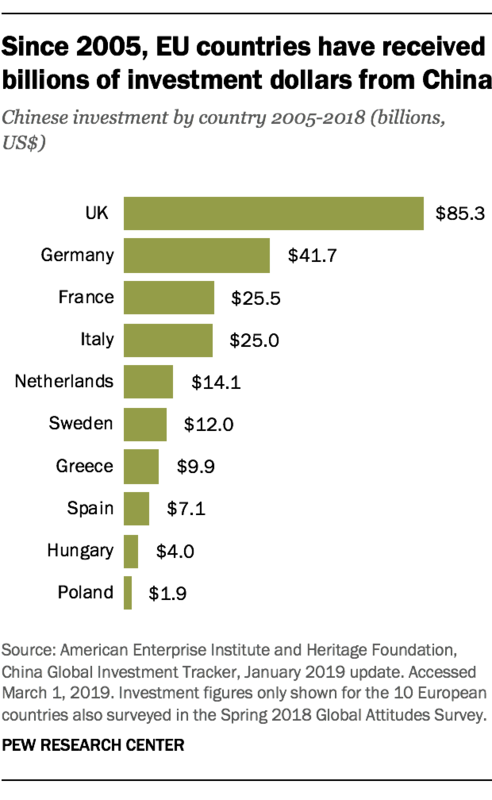 Among the countries surveyed, the UK tops the list at roughly $85 billion, more than twice as much Chinese investment as Germany, the next-highest. 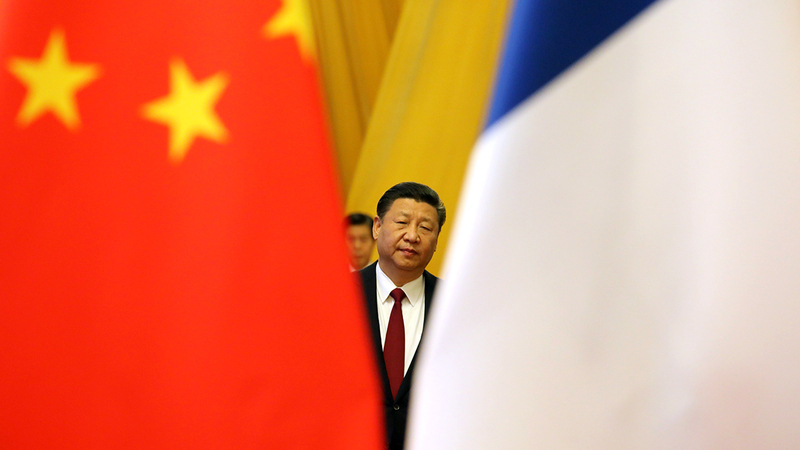 France and Italy, which will both host official state visits for Xi during this European trip, have each received about $25 billion from Beijing. Huawei Technologies and ZTE Corporation, both large Chinese telecom companies that have been entangled in U.S.-China trade disputes, have cut more than $3 billion worth of deals in Italy since 2010, with additional Huawei projects in the UK and Hungary. These investments across Europe are not all official projects under the Belt and Road Initiative umbrella but instead show the overall trend of major Chinese investments abroad.